The PM was last here in November. In Varanasi, the Prime Minister would dedicate the 6th International Rice Research Institute South Asia Regional Centre (ISARC) campus to the nation and also attend One District, One Product Regional Summit at Deendayal Hastakala Sankul. He’ll also unveil a postage stamp on Maharaja Suheldeo and address a public rally of the Rajbhars at the ITI ground, Ghazipur. Elaborate security arrangements have been made in both the districts and SPG sleuths are in place to oversee the PM’s security, reports said. 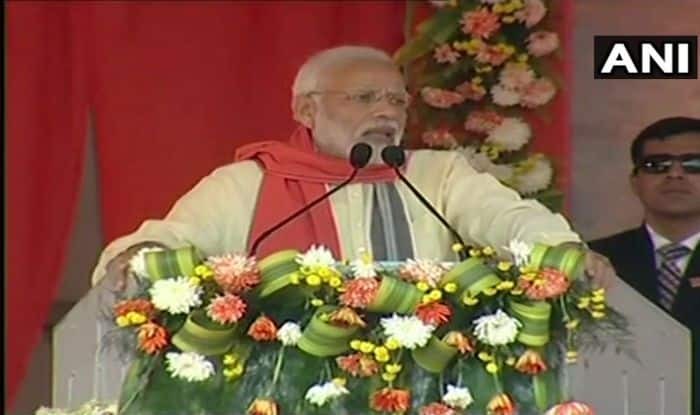 Sources in the BJP said that during his programme in Varanasi, the PM will dedicate 2 STP, water treatment plants in Sarnath and Mahatma cancer institute in BHU, along with other projects on the day. The PM is also slated to visit the places where the Pravasi Bharatiya Diwas would be held from January 21, to review the arrangements. Modi came to Varanasi last on November 12, when he addressed a public meeting in Wazidpur, after inaugurating several projects. State Minister Anil Rajbhar, who is in charge of the Ghazipur rally, said that the rally named after Maharaja Suheldeo would be attended by more than five lakh people of the adjoining districts. The PM would be visiting Ghazipur after a gap of two years. He last went there on November 14, 2016, when he announced several projects, most of them of Railways. Minister of State for Railways Manoj Sinha also represents Ghazipur in the Lok Sabha. Meanwhile, state Cabinet minister and the SBSP president OP Rajbhar has announced that he wouldn’t be attending PM’s rally in Ghazipur. Rajbhar, who represents the Zahoorabad assembly constituency in Ghazipur district, is the Backward Class Welfare and Divyangjan Empowerment minister in the state government. His SBSP is an ally of the BJP in Uttar Pradesh. The Minister was upset over not getting the invitation on time so he chose to boycott the PM’s rally though BJP leaders were reportedly trying to pacify him. Some reports suggested Rajbhar was upset over the commemorative postal stamp on backward caste leader Maharaja Suheldev Rajbhar not carrying his full name. He is also reported to have claimed he was never invited for the programmes of the prime minister in that district and other parts of Poorvanchal. The SBSP chief said his party was preparing to contest the Lok Sabha polls on its own in UP. “I will not attend the December 29 programme of Prime Minister Narendra Modi in Ghazipur,” Rajbhar had told reporters. All’s also not well between the BJP and another ally, Apna Dal (S). The party is represented at the Centre by Anupriya Patel, an MP from Mirzapur. Patel said she stood by the remarks of her husband and party president Ashish Patel, who had voiced frustration with the saffron party over its “treatment” of smaller NDA allies. Ashish Patel had recently alleged that smaller parties were feeling “ignored” by the bigger NDA partner — the BJP. Alienation of smaller parties could prove to be fatal for the BJP. The Apna Dal (S) has a presence in over 15 of the 80 Lok Sabha seats in Uttar Pradesh, with its core voter base of Kurmi Patel, and nearly one lakh of them only in the prime minister’s constituency.